Behind them, sitting on the sofa, are the future bride and groom. The son of the earl, richly dressed, isn't remotely interested in the affair. He doesn't even bother to look at his fiancée, busy as he is at staring at himself in the mirror. The poor young girl, on the other hand, is distraught. She's wringing her handkerchief, while the lawyer Silvertongue is trying to console her. Over the couple hangs a picture of the Medusa by Caravaggio, while, in the left bottom corner, two dogs are chained to each other. These elements further emphasize how doomed their marriage is. The couple is now married but far from happy. In fact, they aren't even interested in each other's company, and have spent the previous night apart. The husband has just come back to a messy home after a night out. 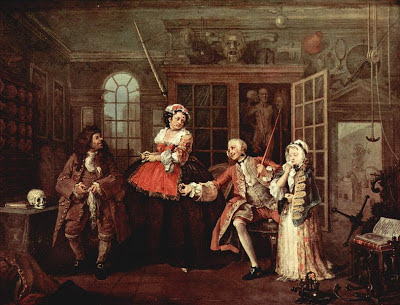 He spent it gambling (and losing), fighting a duel (which again he lost as it can be inferred from the broken sword at his feet), and whoring (as the lady's cap pulled out from his coat pocket by the dog clearly shows). But the lady's cap is not the only thing that he's gotten from his extramarital affairs. The black mark on his neck is a sign of syphilis. His bride doesn't seem too distraught anymore. She must have decided, since she's married to a man she doesn't love, to at least, enjoy the money and opportunities that come with her new status. She enjoys attending and giving house parties (she hosted one the night before) and has even started to have affairs too, as we can infer from her open posture. The phallic statuettes on the mantel indicate the strong sexual appetites of the couple, which however, they don't seem interested in fulfilling in the marital bed. Their steward walks away with a handful of bills after having tried, and failed, to make them realise that, if they keep up this licentious and extravagant lifestyle, they'll soon be broke. The Viscount, together with his young mistress, is visiting M. de la Pillule, a quack, to find a cure for their STD, as the treatment previously prescribed to them just isn't working. The poor young girl, as the open sore on the mouth she's dabbing at reveals, has just contracted syphilis, probably from her lover. Unlike the Viscount, who doesn't seem to take anything, nor even his health, seriously, the girl is quite upset. The other woman in the picture seems to be the young mistress' mother, and she too shows signs of having contracted syphilis. The whole office is littered with macabre objects such as skulls, bones and sarcophagi that seem to predict an ominous fate for the doctor's visitors. What is the wife doing while her husband, who has now become an Earl following the death of his father, is visiting a quack? She's enjoying her morning toilette, a ritual that only the very rich could afford. A singer and a flutist, both famous Italian artists of the time, are entertaining the Countess' guests. The Countess, who's having her hair dressed by a French barber, is deep in conversation with the lawyer Silvertongue, who's inviting her to a masquerade as we can infer by his pointing to a masque. Masquerades were famous for the licentious behavior in which the guests, hiding behind their masks, indulged in. There are lots of clues in the picture that clearly show that, if the Countess and lawyer aren't lovers already, they soon will be. The walls are full of pictures with sexual connotations. Zeus and Io by Correggio depicts the Greek god, in the form of a cloud, impregnating the beautiful nymph; another painting shows once again Zeus, who, having fallen in love with Ganimede, brings him to Mount Olympus to be cupbearer of the gods; a biblical picture represents Lot with his daughters, who tried to seduce him. On the floor, a young page is holding a statue of Actaeon, the huntsman turned into a stag by Artemis for spying her while bathing. 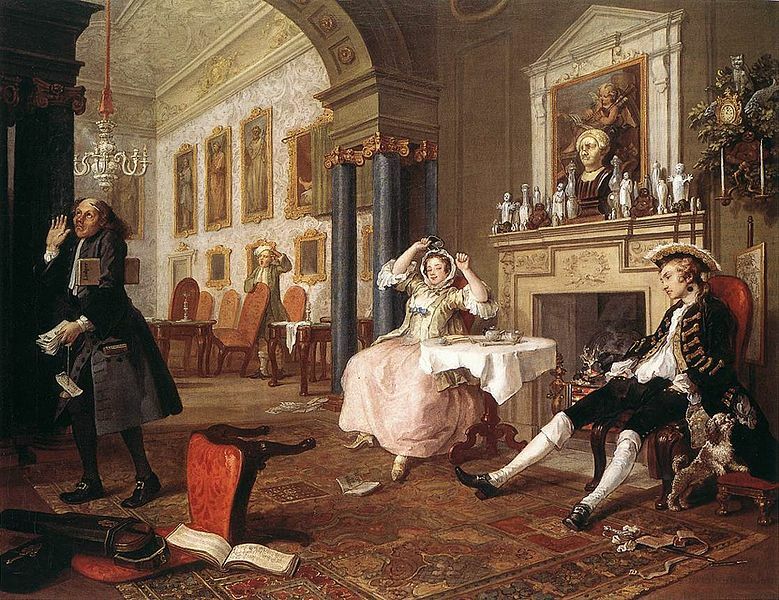 The Countess and the lawyer, as we can see from the masks on the floor, did go to a masquerade, and then, decided to consummate their illicit relationship. But where to go to do that? To a bagnio, of course. At the time, bagnios were like those modern motels where you can rent a room with no questions asked. But her husband managed to find her, and catch her in the act, anyway. And with nefarious consequences. A duel ensued. As we've previously seen, the Earl isn't very good at fighting. He gets mortally wounded. 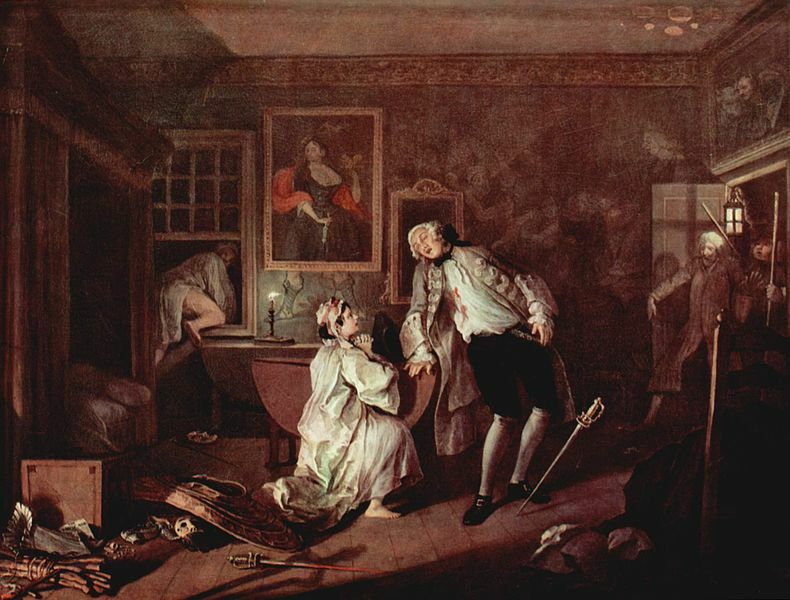 As his wife kneels on the floor begging for his forgiveness, the murderer, still in his night shirt, escapes from the window. The master of the house, hearing the tumult, bursts in and sees this horrid scene. The tapestry that covers the wall depicts the Judgment of Solomon, which recalls the couple's selfishness that has led them to their doom. In the previous picture, the lawyer escaped through a window, but he didn't go far. He was arrested, found guilt of murder and hanged at Tyburn. His dying speech lies at the feet of his lover. The distraught Countess is about to join him. 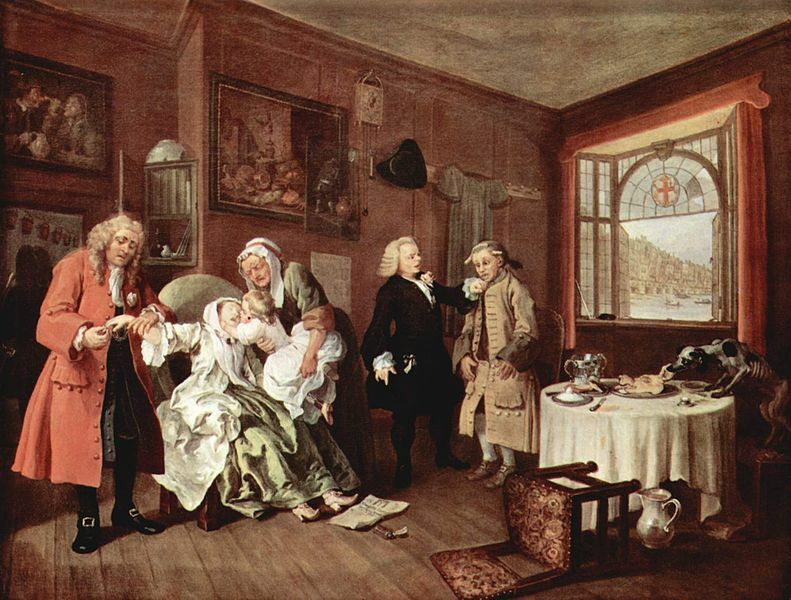 She poisoned herself with laudanum. As she is about to die, the nurse brings her her daughter to say goodbye. It doesn't look like the child will have a long and healthy life either. She has already contracted syphilis from one of her parents, and is crippled. The Countess' father, far from regretting the marriage he had arranged and the pain it has brought to his daughter, is even now trying to make money exploiting her. He's stealing a ring (and probably anything else he can get his greedy hands on) from her finger, knowing that all the possessions that belonged to people who committed suicide are to be forfeited to the state. The dim-witted servant who fetched the poison to her mistress is being reprimanded for his mistake. A very thin dog is taking advantage of the commotion to steal food. The surroundings are very different from the previous opulent mansion she used to live in after her marriage. 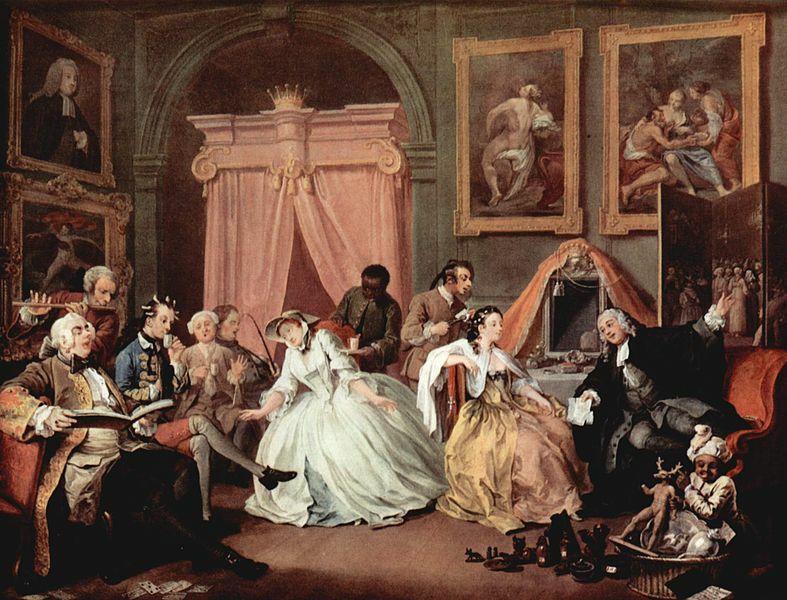 This series of painting clearly showcases the folly of marrying for money rather than love. No one has gained anything bar misery and despair from it. The young couple is dead. Their only child is a daughter (and a sick one too), which severs the end of this family line. Even the merchant who sold his daughter to the rich Earl's son didn't obtain the wealth he imagined, but has to steal whatever he can before everything is taken by the State. 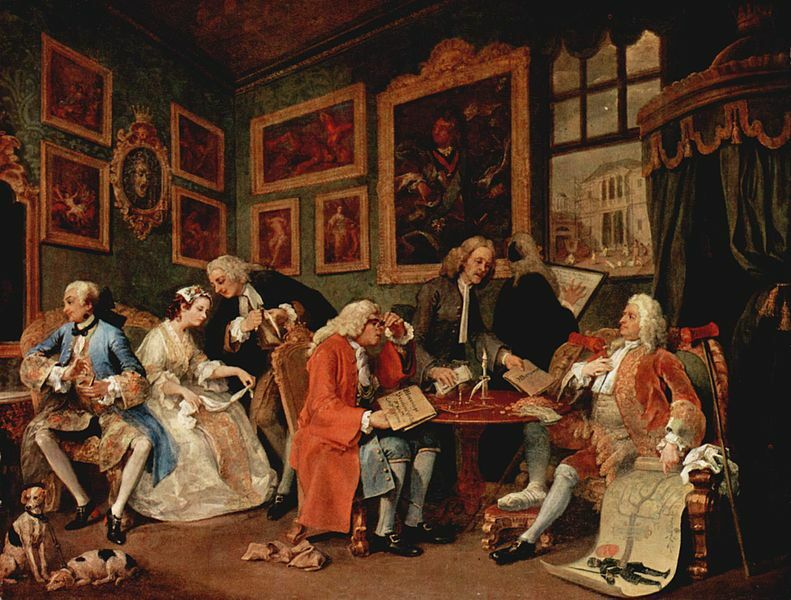 This criticism, however, didn't go down well with the aristocrats of the time, who greatly indulged in this practice and, as a result, Marriage A La Mode didn't make as much money as its author had hoped. But, hopefully, it made people reflect on the evils of this practice and, thus, contribute to its abandonment.